The Island of MOLOKAI looking West from Papakea Resort. On the way to Hole 12 of the Lanai Putting Green of the Papakea Resort. Continuing the walkway to the beachfront. Papakea front yard and walkway to the beach. Mother whale teaching her baby how to breath out of water. This mother stood on her head for about five or six minutes as her baby attempted jumps. This photo was taken on the leeward side of Maui, south of Lahaina. 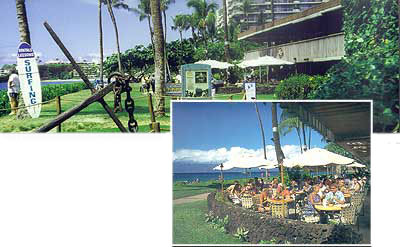 Standing on beach in front of Whaler's Village looking North to Black Rock upon which rests the Sheraton Hotel Resort, South Face. "S"-Turns Beach Front, looking North. The "MAUIMAN" stirring up his "Award Winning Maui Chili".